Autumn always brings to mind Friday nights in Georgia in the late 1950's and early 60's. High school football games were a big part of our young social lives. My school was the Academy of Richmond County.... we called it "A.R.C." ARC always had a powerful team, usually in contention for the state AAA championship. We were a big school, with good coaches, offering a dependable stream of quality players to the University of Georgia and other colleges. Several friends and acquaintances got scholarships, and a bit of glory on the gridiron..... though not one ever made it to the NFL. 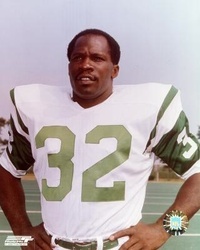 That young Augustan went on to play 10 seasons as running back for the New York Jets. In fact, for a few years, he ranked as the Jet's all-time leading rusher. Emerson was there in 1969 when Joe Namath led the Jets (of the old AFL) to a shocking 16 to 7 victory over the NFL's big, bad Baltimore Colts in Super Bowl III. I still believe that was the most exciting Super Bowl game ever played. During high school, and even after graduation, I attended a lot of football games in Augusta. Those were the same years Emerson Boozer was playing his high school football. And even though he led his team to a State Championship, I never saw him play...... I knew nothing of his team....... and, in fact, I'd never even heard of him. Back then, there were only two public high schools in Augusta.... ARC and Lucy Laney High. All white students attended ARC, and all black students attended Lucy Laney. The two schools never played each other. And most of the local press coverage went to ARC and a few other area schools, attended by white students. The first time I was even aware of Emerson Boozer was in the mid-60's while I was working in TV there in Augusta. I covered a press conference where Emerson was introduced as the newest draftee of the New York Jets. He had just finished his college career at, what was then, Maryland State. Over the next decade I watched Emerson's remarkable pro career with great interest and pride. My goodness, my fellow Augustan was something to see. These days - I'm told - Emerson is happy and well, and living on Long Island, New York. From the vantage point of 2006, it seems odd the way things were just a little more than 40 years ago. Emerson Boozer and I grew up within a few miles of each other, but it might as well have been half a world apart. I probably missed out on some good friendships. I'm absolutely certain I missed seeing some good high school football games. But that's the way it was. It goes without saying that Steve was and still is infinitely and incomparably more important than anything that ever happens to the Oregon Ducks. But we graft emotions about the important stuff in life, stuff we couldn’t ordinarily find voice to express, into the rise and fall of the sports teams we support. I know know you are gone now Dan. I was reminiscing Emerson Boozer who I watched and much appreciated as a kid. Thank you so much for your thoughts about him, and my favorite AFL/NFL team, the New York Jets.